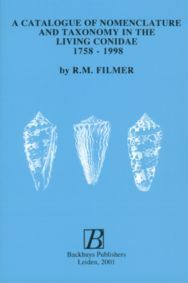 This book is a catalogue of all species names of the living Conidae published between 1758 and 1999. The work is based on the catalogue by Tomlin published in the Proceedings of the Malacological Society in 1937. The book conforms to the latest (4th) edition of the Code of the International Commission on Zoological Nomenclature. Included is an alphabetical list of all names. For each name, the author, name and date of publication, whereabouts of the type species, type locality, nomenclatural and taxonomic status is given. There are lists of spelling errors, works and names rejected by the ICZN, names by authors and a numerical summary. This is a reference book for those involved or interested in the nomenclature and taxonomy of the Conidae. It enables readers to check on factual data and the author´s opinion on the taxonomic status of each name.